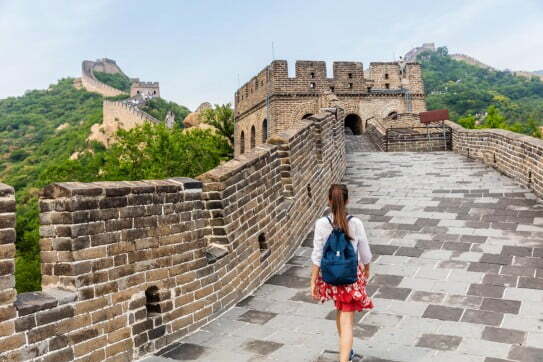 Explore magnificent heritage sites and marvel at the Great Wall of China as it twists and turns through nearby hills. Beijing has more than 3,000 years of recorded history and six UNESCO World Heritage Sites, which tell of a past steeped in imperial tradition and ritual. As the city propels itself into the future, the reminders of a vibrant, rich history are honoured and preserved everywhere you go. 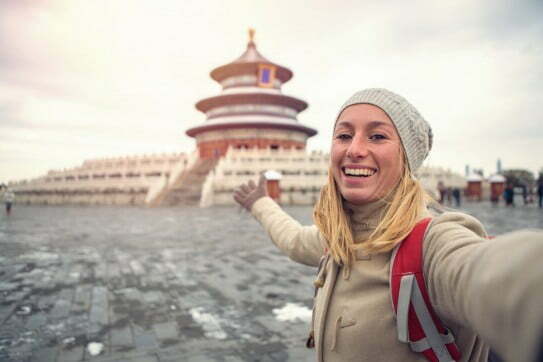 Exploring Beijing could be as close as you'll ever get to time travel! 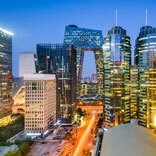 In the centre of Beijing is Tiananmen Square, one of the city's most famous attractions. Every day thousands of people visit the square to watch either the flag-raising or flag-lowering ceremony. Other must-sees in the square include the Tiananmen Tower, Monument to the People's Heroes, Great Hall of the People and Chairman Mao Zedong Memorial Hall. From Tiananmen Square, you can head north to the Gate of Heavenly Peace and follow the citadel walls until you find the Meridian Gate, the entrance to the Forbidden City. Built in the 15th century, the Forbidden City is now a UNESCO Cultural Heritage site and one of the five most important palaces in the world. It was built to house the emperors of the Ming and Qing dynasties. They were believed to be 'sons of heaven' and worthy of a divine place that was forbidden to ordinary people. The 9,999 rooms are filled with ancient artefacts and surrounded by 3.5km of imposing citadel walls. Redolent with imperial history, the Forbidden City is enchanting and mysterious. Located a 15km bus ride from Beijing, the gardens of the Summer Palace cover about three square kilometres and can easily take a day to explore (or half a day if you walk fast!). The palace was constructed in 1153 as a place for the royals to escape the stifling heat of the city in summer. It's been repeatedly destroyed and rebuilt, following wars, attacks and fires throughout its long history. The Summer Palace has two main attractions: Longevity Hill and the sparkling Kunming Lake. During his reign, Emperor Qianlong ordered 100,000 labourers to enlarge the existing lake and it now covers about three quarters of the park area. You can take a ferry to South Lake Island or walk over the beautiful 17-arch bridge to the eastern lake shore. You can also walk right around the lake, just make sure you wear comfortable shoes. For your daily dose of cardio exercise, hike up Longevity Hill to the Buddhist Temple overlooking the park. There are a number of buildings to visit here, so take your time and explore the ancient history thoroughly. The Great Wall climbs and twists its way across China's northern border. It was built in stages in an effort to repel Mongol invaders, among others. The wall was constructed in parts and then joined together later. The earliest section of the wall was built around 220BC, but very little of that structure remains. The majority of the remaining wall was constructed from 1368 to 1644. It's about 6000km long and four of its main sections are easily accessible by subway or bus from Beijing. Jinshanling is great for those who enjoy a robust walk. Located 125km northeast of Beijing, it's 10.5km long and has five passes and 67 towers that are constructed from a variety of materials. This is also where the Great Wall marathon is held in April. Mutianyu is one of the most well-preserved sections of the Great Wall. 65km north of Beijing, it's set amidst lush scenery, surrounded by wildflowers in spring and a riot of golden leaves in autumn. In winter, you'll find it white with snow - perfect for a three-minute luge ride! This section of wall is well-restored and has a 5km cableway to make exploration easier. A special highlight of Mutianyu is the luge (toboggan) ride - amazing fun! The Great Wall climbs and twists its way across China’s northern border. It was built in stages in an effort to repel Mongol invaders, among others. Badaling is the most-visited part of the Great Wall. It's only 70km from Beijing, so easily accessible, with sections that are not as steep to walk up. There's much to see here, including watchtowers, holes drilled through the wall to allow easy shooting at enemies, and store rooms for supplies. Simatai is not as well-preserved or restored as other sections, allowing you to feel the full impact of the Great Wall's antiquity. You can even take an atmospheric night tour to fully immerse yourself in the wall's romantic-yet-violent history. Simatai also has quite diverse styles of beacon towers and an almost vertical set of large steps (called the Heavenly Ladder) that lead to the precarious Fairy Maiden Tower. It's 120km north east of Beijing. The Temple of Heaven complex was visited by the Emperors of the Ming and Qing dynasties to pray for bountiful harvests. Parkland surrounds the amazing temples, which are positively dripping with ancient history. Start at the east gate and head towards the Long Corridor. This is an ideal spot to relax for a while and indulge in people-watching, as local octogenarians' play cards and Chinese chess. Follow the Long Corridor to the Hall of Prayer for Good Harvests. This astounding building is 38m tall, with elaborate carvings and decadent paintings adorning every surface. Built in 1889 to replace the original that was incinerated by wayward lightning, the ceiling is supported only by wooden pillars with no nails or cement. Next, you'll have to flash your passport to get into the Fasting Palace where the visiting Emperors stayed, abstaining from food, music and conjugal relations to ensure a plentiful harvest. Make sure you visit the Imperial Vault of Heaven and whisper at one end of the echo wall - anyone at the end will hear you perfectly, or so the legend goes. The word 'hutong' literally translates to 'a well' in Mongolian. Villages would dig a well and then build their streets and lives around it. Now, a hutong has come to mean a lane or alley where these bygone Beijing residents lived. The hutongs that remain allow you a glimpse into the past, where Beijing began. You'll be entranced by the dainty shops lining the streets and plentiful food options. They are narrow and easy to get lost in, so take a map. North of Forbidden City, Nanluogu Xiang ('Drum Lane') is about 800 years old. At 787 metres from end to end, it's one of the longest lanes in the city. Here you can see many traditional courtyard dwellings, with red lanterns hanging brightly under solemn grey eaves. If you turn left at the end of Nanluogu Xiang, you'll soon come to Drum Tower. This was originally constructed to tell the time and was used up until 1924, when Beijing adopted western-style clocks. In the top floor, you’ll find the space that housed 24 drums that were played in complex patterns to indicate the time.